Willing to be dedicated to Science? Yes, I am! Thanks to the International Association for the Exchange of Students for Technical Experience (IAESTE), I got the chance to work in Sálim Ali Center for Ornithology and Natural History(SACON) for 2 months from 28th June to 30th August. The Institute where I have just completed my internship is a wonderful place. Surrounded by mountain and forest with a lot of wild animals, the institute is just like a zoo but more interesting with the animals not being kept in cages. Placed in Anaikatty, Coimbatore, Tamil Nadu, India, it has been chosen for International Conference on Indian Ornithology twice continuously and the 2nd International Conference on Indian Ornithology will be held on November 19th to 23rd, 2013. Besides, the mission of the Institute is to service bird life and conserve natural resources, which is probably a side of my future job. Natural resources are very important for human and wildlife. For example, nowadays, people are using a lot of pesticide for cultivation and from the scientists I have got to know that how exactly it affects on bird in morphology such as deformation on birds. This is really attractive to me. The scientists here are doing conservation projects about a particular bird, monkey, and other animals. Some other scientists are conducting researches on air pollution, water pollution and influence of pesticide on birds, etc. Two months is a short time but it is also enough for me to examine my love for wildlife, nature and see how environment pollution affects wildlife. In the first week, I was assigned to go around the campus every morning and afternoon to classify the common birds. Given binocular to observe the birds, I started the project after the first week. The first task was what I suggested that I would figure out the common birds in five different habitats, the second was study about white-headed babbler, Turdoides affinis. I was instructed the methodologies for those work. For the first task, I chose 4 points in each habitat and used point counting to survey. For the rest task, the first month I recorded the video of the bird around the campus, then the second month I worked in laboratory, my mentor helped me analyze the bird behavior from videos. All of them are of my interests during the two months. It is my honor to work with scientists in SACON and discuss the researches with them. They showed me what critical thinking is, how to effectively conduct the researches by finding the interesting points then cool your mind always, and most importantly, do things with your passion. It is so much more interesting than studying theories in the class. In SACON, you can study whatever you are interested in. In addition to my project, I often went to the laboratory in which other scientists and their fellows were testing the soil and water samples. I got chance to join in testing water samples. It is a very meticulous job. The work obtained all my time so I just have a short trip to Ooty, Tamil Nadu. 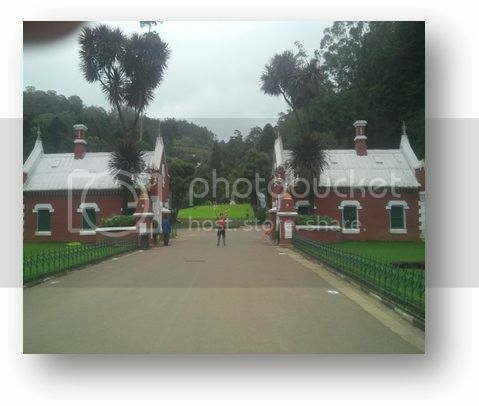 Ooty is located 2400m above sea level, the weather is cool and foggy all around the year. Botanical Garden is the most famous place there. This garden is built the same as Italian style, visit this garden you will have the feeling that, you are travelling in Europe. And another place in Ooty is peak point, climb up to the point you can see the whole of Ooty city. I was unlucky because I went there in a foggy and rainy day. In India, people eat by hand only. There are 2 times I was forced to eat by hand. I went to the restaurant in Coimbatore city, after they served food, I asked for a spoon, but they said they do not have any spoon. So, I ate by my hand. I did not really like it, though. I got a lot of experiences in working, my mentor showed me a lot from a small skill such as always keep a copy with you of any paper that is related to you, and when you want to check an important form or in particular, a scientific name, you need to reserve reading, etc. The scientists in SACON are very funny, and they are always willing to share their knowledge. I am very happy to work with them. From my work, I formed clearly about my job in future, it is very diversed. And I love what I am studying, I think that is very important to me now.